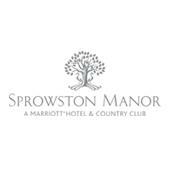 Marriott Sprowston Manor Golf Club is a public golf course located in Norwich, England. The course originally opened in 2003. The course consists of five Par 3's, nine Par 4's and four Par 5's and plays to a maximum distance of 6547 yards with a standard scratch score of 0 over 18 holes. Two sets of men's tees and a single set of ladies' tees create an enjoyable test of golf for players of all abilities. Rental services are available including motorized carts. The practice area at the facility includes a full service driving range and separate chipping/putting greens. Food and beverage options include a restaurant with full service bar.